They are Mausoleum of Khoja Ahmed Yasawi, Petroglyphs within the Archaeological Landscape of Tamgaly and Saryarka — Steppe and Lakes of Northern Kazakhstan. The eight new cultural sites of the Silk Roads network of Chang’an-Tianshan Corridor were inscribed on the World Heritage List in 2014: the sites of Kayalyk, Karamergen, Talgar, Aktobe, Akyrtas, Kulan, Kostobe, and Ornek. It is a remarkable concentration of some 5,000 petroglyphs (rock carvings) dating from the second half of the second millennium BC to the beginning of the 20th century. Distributed among 48 complexes with associated settlements and burial grounds, they are testimonies to the husbandry, social organization and rituals of pastoral peoples. Human settlements in the site are often multi-layered and show occupation through the ages. The central canyon contains the densest concentration of engravings and what are believed to be altars, suggesting that these places were used for sacrificial offerings. The site comprises two protected areas: Naurzum State Nature Reserve and Korgalzhyn State Nature Reserve totalling 450,344 ha. It features wetlands of outstanding importance for migratory waterbirds, including globally threatened species, among them the extremely rare Siberian white crane, the Dalmatian pelican, Pallas’s fish eagle, to name but a few. The 200,000 ha Central Asian steppe areas included in the property provide a valuable refuge for over half the species of the region’s steppe flora, a number of threatened bird species and the critically endangered Saiga antelope, formerly an abundant species much reduced by poaching. The property includes two groups of fresh and salt water lakes situated on a watershed between rivers flowing north to the Arctic and south into the Aral-Irtysh basin. Between the 8th and 4th centuries BC, it was the largest trade, crafts and cultural centre in the north-east of Semirechye and the capital of Karluk rulers. The territory is fenced by a fortified wall up to a height of 4 m. The city was famous for its bazaars and Christian churches. Archaeological excavation of the site was conducted in 1964. The researchers discovered Buddhist and Manichean temples, objects of the Muslim culture of the 12th — 14th centuries, including cathedral mosque and mausoleums. Karamergen was the largest and the northernmost medieval city of agricultural civilization in the ancient Ili Delta in the 12th — 13th centuries. Today, the site in the territory of Almaty region is the object of tourism and research. Despite the destruction and erosion, it still has some remains of buildings made from straw bricks and developed irrigation system. The site of Talgar was located on the right bank of the Talgar River. It was quite large medieval city totalling 28 ha in the 10th century. Now the remains are the quadrangular highland surrounded by the wall of earth. 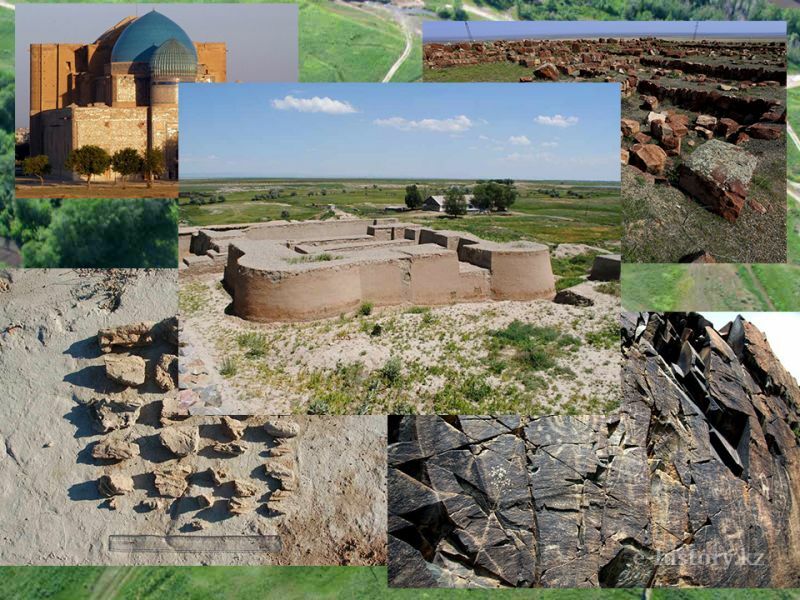 The remains of Aktobe are located in the territory of Shu area, Zhambyl region. It comprises the three parts fortifications, Shakhristan (the central part of the city) and Rabad (neighbourhood of the city). It is surrounded by 2-3 walls and deep defence trench. The city existed in between the 6th and 13th centuries during the flourishing of the Turkic and Karluk Kaganates. The palace in the centre of Shakhristan has 20 rooms. The palace complex was constructed between the 8th and 9th centuries in Zhambyl region of Kazakhstan, 45 km away from the city of Taraz. The history of its research started in 1861. However, there is no clear agreement yet on who was its founder. Some people believe that Akyrtas was built to be a Buddhist or Nestorian monastery of an Arabian palace. This historical and cultural monument dates from the 6th — early 13th centuries. The complex of different monuments is located not far from the village of Kulan, Ryskulovsy area, South-Kazakhstan region. Today it is famous for the fact that the ruling dynasties of Western Turks were overthrown there. It is situated to the East from the village of Sarykemer, on the right bank of the Talas River. The site was constructed between the 6th and 12th centuries. The central remains are rectangular highland, fenced by walls with towers and surrounded by trench beyond the outer wall. The site had four gates. It is located between the two rivers — Altynsu and Shybyndy. The site dated from the 8th-12th centuries. The central part of Ornek is quadrangular ground. 31 towers are situated around the perimeter. A medieval mosque was discovered by archaeologists in the central part of Ornek. It should be a huge and rich city.